This claim will pay out based on the date of the flight that wins the X PRIZE. This $10,000,000 cash prize will be awarded by the NASA-endorsed X Prize Foundation (see http://www.xprize.org/) to the first team to build and fly a reusable spaceship capable of carrying three individuals on a sub-orbital flight. For details on the X PRIZE competition rules and guidelines, see http://www.xprize.org/teams/rules.html.asp. The flight vehicle must be flown twice within a 14-day period in order to win. We will use the return date of the last flight for this claim. The claim will pay out 100 if this date is in or before 1/1999, and one point less per month after that: 88 in 1/00, 76 in 1/01, 64 in 1/02, 52 in 1/03, 40 in 1/04, 28 in 1/05, 16 in 1/06, 4 in 1/07, down to a payoff of 0 in or after 5/2007, or if the X PRIZE is cancelled. For a full table of payoffs by month, see http://www.cs.unm.edu/~patrik/XPRIZE.html. In short, the organization states in its correspondence that a.) it has the financial resources to pay out the prize, a fact document by unnamed accounting firms, and b.) 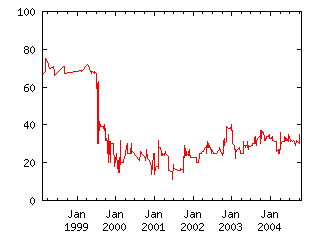 a winner is not expected until 2001-2002. If the prize is cancelled before a flight is made, regardless of the reason, the "yes" coupons pay 0, "no" coupons pay 100 -- just as indicated in the claim description. On the other hand, if a flight made by an official entrant successfully fulfills the X-Prize requirements AND the X-Prize is still officially in existence, that flight date sets the pay-off value of the claim. The claim is based on flight dates, not award dates. By extension, the claim is based on the actual flight, not the award. Therefore, the value of the actual award given is not important, as long as a competitor qualifies for the award and the competition has not been officially cancelled by the sponsoring organization.